My grandmother, ‘Gramman’, has been cooking for her family since she was 11 years old. Needless to say, she’s pretty good at it! I’ve tried to jot down as many recipes as I can from her. The problem is…measurements for her are ‘a dash of this’, ‘a pinch of that’, or my all-time favorite, ‘until it feels right’. What does that even mean?! The more I develop my own cooking skills, the more I realize I’m more like Gramman in this respect than I originally thought. But my version might be ‘until it tastes right’. I definitely like to sample as I go! 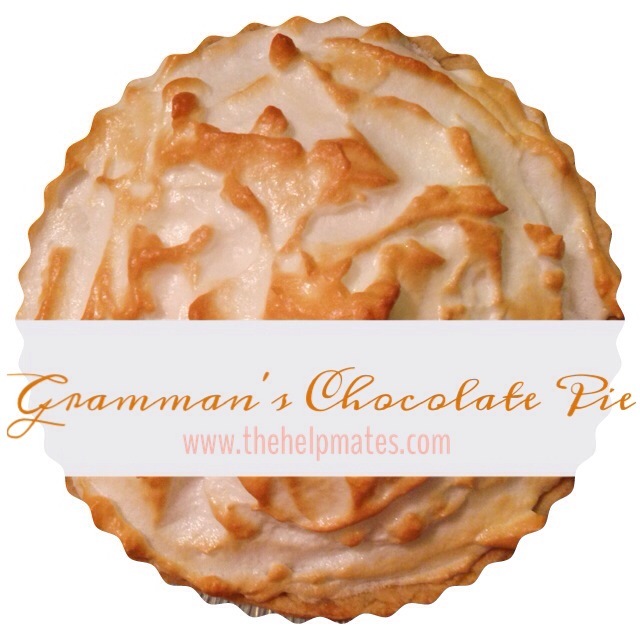 This is the first recipe Gramman ever taught me, her famous chocolate pie. The original recipe calls for meringue on top, which is how I will make it today. However, Matt & I both prefer cool whip. I’ve been a little turned off by meringue ever since my Granddaddy Bill told me it was cow slobber. • Heat 1.5 cups of water in a pot (medium/low-medium). Get it hot, but not to a boil. • Separate eggs, yolks in one bowl and whites in another. • In the yolk bowl, combine 1 cup sugar, 5 TBS flour, 3 TBS cocoa, 2 TBS cold water, and a pinch of salt. • Add this mixture to the hot water pot. • Stir until it’s an even consistency, then add ½ stick of butter. • Pour mixture into crust, set aside. • Add about 3 TBS of sugar and a sprinkle of cream of tartar to the egg whites. • Spoon meringue on top of chocolate pie and carefully spread to edges of crust. • Bake again until meringue is browned. • Cool in fridge for 2 hours and serve. And there ya have it! I hope our pie recipes this week have been helpful in getting you into the Thanksgiving spirit! What are some of your favorite pies to make this time of year? I’m always looking for new recipes…especially if you have a favorite homemade crust. I’ve tried a handful, but I’ve yet to find a favorite. Help me out! !